Medium garnet color, slight fade at the rim. Intensely fragrant nose, reminiscent of northern rhone syrah and its brooding aromatics: warm brick and decayed red fruit, pipe tobacco, sweat and well hung game. Smoke, coffee and spice from the barrel toast. More musk and savory tones on the palate: briary mulberry, medicinal cherry, dried flower, licorice. Fullish body. Feral finish with a hint of citrus peel. Very ripe, almost exotic. Plush and a touch sweet. But not without touches of grace and finesse. The slightly dry tannin and correct acidity provide excellent grip. The ’94 CVNE Rioja Imperial Gran Reserva is much more classic. This is a more modern expression, open and intent on seduction. A fine bottle with a finite future. 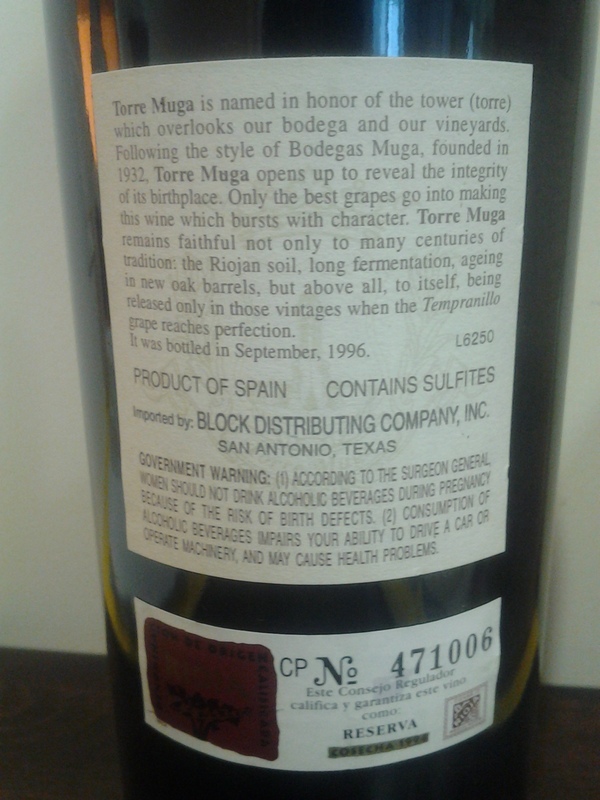 We can envision a point over this decade where these Torre Muga ’94s will approaching its end while the CVNE Imperial Gran Reserva ’94s will barely be hitting their stride. Now – 2020.